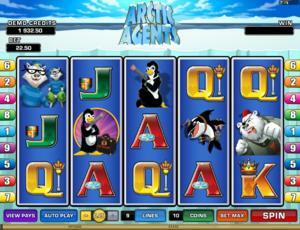 Arctic Agents is an online video slot machine game from Microgaming that has been released in May 2013. This online video slot game has 5 reels and 9 pay lines. The theme of Arctic Agents is somewhat inspired by The Penguins of Madagascar, namely Skipper, Kowalski, Private and Rico. Those who love spy-themed, action-packed cartoon shows will definitely have a great time playing the Arctic Agents online video slot game. If you loved to watch The Penguins of Madagascar, then you can surely relate to the theme of this game. In Arctic Agents, you get to meet Agent Penguin who is on a mission to guard a Top Secret briefcase and keep it safe from the Snow Cat bandits and their Polar Bear boss. Unlock the Free Spin Bonus Feature game and you can win up to 20 Free Spins with up to a 50x multiplier on your total bet! Since the world of espionage involves risks, this game also has a Gamble Feature, wherein you can double or quadruple your wins if you get lucky! Microgaming online slot games are accessible to players in 2 formats – download and no-download. Most people typically prefer to download software because they can enjoy Microgaming’s entire list of online slot games in one download only, while there are those who would like to play instantly so that they can find out if a certain slot game is fun and exciting enough to spend their precious time and real money with. Whether you like to download their software first or you prefer to play instantly without the need to download, then Microgaming surely has slot games to cater to your specific slot gaming standards. Arctic Agents belongs to the instant play category of Microgaming slot games, which means it can be played for free or for real money without the need to download anything. Arctic Agents features scatter wins, a Wild multiplier symbol, a maximum jackpot win of 12,000 coins, a Gamble Feature, a Skill Stop Feature that allows you to stop the reels from spinning even before they stop spinning on their own, and a cool Free Spin Bonus Feature game with up to 20 Free Spins and up to a 50x multiplier bonus! If you have a penchant for watching movies that involve dangerous spy missions and very sleek secret agents, or you just love those adorable penguins in The Penguins of Madagascar TV show, then you will absolutely love playing at the Arctic Agents online slot machine game! The quality of the graphics and sound provided by Microgaming software is without doubt excellent. They hold an impeccable track record of generating the most spectacular graphics and realistic sound effects. A lot of online slot players love Microgaming because its online slot games have smooth animation and remarkable yet non-intrusive background music and sound effects. In Arctic Agents, they have really done an outstanding job of bringing together a savvy spy agent theme in a slot machine game. The symbols are drawn in a cartoonish manner, and even if they are brightly colored, you will still play for a long time as it does not strain or hurt your eyes. A lot of people stated that they love the comical animated programming and the quirky sound effects that come with the symbols as it makes them remember penguin spy agents (Penguins of Madagascar, anyone?). The overall graphic design of Arctic Agents mainly displays the color blue and white – the perfect color combination that definitely says ice and snow! Other colors used include green, purple, orange, yellow, red, black and white. There is no constant background music and sound effects you will hear while playing this game. When you spin the reels, a flickering sound will be heard. When you form winning combinations, simple arcade-type music and sound effects are programmed to celebrate your wins. Savvy action music is played out when a winning combination with the Penguin wild symbol is formed. The no card deck symbols available in the Arctic Agents online video slot game are J, Q, K, and Ace. The regular symbols that you will find in Arctic Agents are: the Snow Cat Bandits, the Polar Bear, the Female Agent Penguin, and the Orca. The Wild Symbol is Agent Penguin (with a briefcase marked Top Secret). It is a wild multiplier symbol. Thus, the Agent Penguin wild symbol not only acts as a substitute for all other symbols (except for the Scatter symbol) in order to you help you form winning combinations, but it also can multiply the payout! The Agent Penguin wild symbol doubles (multiplier x2) the payout of any winning combination it completes, as long as it acts as a substitute symbol. You are paid varying prize amounts (refer to the Payout table) when you manage to form a winning combination with multiple Agent Penguin wild symbols on an enabled pay line. Take note that the Agent Penguin wild symbol winning combination payouts are not doubled. During the Free Spins, all Wild wins are multiplied by 2x the multiplier awarded in the bonus game. The Scatter Symbol is the Arctic Secret Base (pyramid-shaped ice base). Scatter symbols mean that they do not need to appear in a line (on an enabled pay line) for you to win. The Arctic Secret Base scatter symbol can be found scattered anywhere on the 5 reels, and you are able to form winning combinations as long as there are 3 or more Arctic Secret Base scatter symbols that come out. Your winnings are calculated by multiplying the Arctic Secret Base scatter symbol combination payout (refer to the Payout table) by the total number of coins you’ve bet. If you manage to hit 3 or more Arctic Secret Base scatter symbols, you will trigger the Free Spin Bonus Feature game. Please take note that if you get a scatter win and a regular win, then you are paid out for both of these wins, because the Arctic Secret Base scatter symbol is not required to come out on an enabled pay line for you to win. The scatter win is included to the pay line win. Any winning combination can activate the Gamble Feature game as long as the amount of the win will not exceed the gamble limit when gambled. Please take note that if you get any winning combination, you can choose to gamble it in the Gamble Feature game, or you can just continue playing the regular Arctic Agents online video slot machine game. • If you correctly guess the card color, your wins are doubled. • If you correctly guess the card suit, your wins are quadrupled. • Card Color: Black or Red. • Card Suit: Club, Spade, Heart or Diamond. If you correctly guessed the correct Card Color or Card Suit, you have the option to gamble again or collect your winnings. If you choose to Gamble again, then you can select one of the gamble options. If you click the Collect button to collect your winnings, the Gamble Feature game will end, and you will be returned back to the regular Arctic Agents online video slot game. Please take note that you can gamble your winnings until the gamble limit is obtained; during the Gamble Feature game, all winnings are collected automatically; and the gamble limit is set at 5 gambles per game, or up until the gamble amount limit is obtained. Free Spin Bonus Feature Game – If you manage to get 3 or more Arctic Secret Base scatter symbols anywhere on the 5 reels, you will activate the Free Spin Bonus Feature game. In the bonus game, you shall choose from 1 of 5 Arctic Agents (penguins). Once you have chosen, one of the following randomly generated prizes are rewarded and revealed to you: 20 Free Spins with a 2x multiplier for all winning combinations formed in the Free Spins; 15 Free Spins with a 3x multiplier; 10 Free Spins with a 5x multiplier; 5 Free Spins with a 10x multiplier; and 3 Free Spins with a 15x multiplier on all Free Spin wins. While in the Free Spin Bonus Feature game, Arctic Secret Base scatter symbols that appear anywhere on the 1st and 5th reels shall reward you with a randomly generated prize of 2x, 5x, 10x, 15x, 20x or up to 50x your total bet! The prize will not be subject to the Free Spin multipliers. The Free Spin Bonus Feature game cannot be retriggered. Once the Free Spin Bonus Feature game is over, you will be then taken back to the main Arctic Agents online slot game, and your winnings from the Free Spin games will be included to your overall balance. Arctic Agents has 5 reels where you may bet on 9 pay lines. The minimum bet is 0.01 and the maximum bet is 0.25 per pay line. You can wager from 1 up to 10 coins per pay line bet. Therefore, the maximum bet amount is 22.50 per spin. Players who regularly play online casino games apparently like to stay much longer on online slot games that have an Autoplay function. It’s absolutely fantastic that Arctic Agents comes with a helpful Autoplay function! You can have the game spin automatically for you with the Autoplay button (located on the left corner below the reels). Simply click on the Autoplay button and it will continue on spinning until: you have no more coins left to wager, or when you press on the Stop button. Give Arctic Agents a spin and you will definitely enjoy playing this cool espionage-themed and adventure-filled online video slot game!